This set has IT ALL! Beautiful stamped words, beautiful die cuts, lots of greeting options, and some label die cuts to fit the greetings. One of the greetings is large enough to use as a card front by itself. 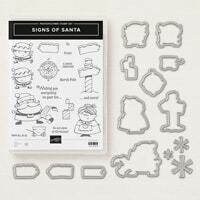 The perfect Christmas stamp set! This one is my favorite because it has Christmas Tree Lights! One of the best things about Christmas... all the sparkly lights. GREAT for wrapping packages, and tags for all seasons. I've already used this for more than just Christmas things. 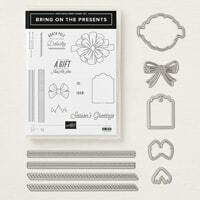 I don't usually do the 'whimsy' thing, but I really love this stamp set and bundle. The DSP and embellishments all work together so well! A great stamp set. 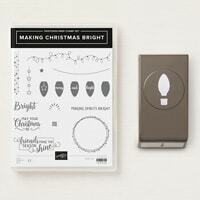 The quintessential Christmas symbol.... a beautiful stamp set, and versatile dies.